to bring you this giveaway to my readers. You can read Nana’s full review HERE. How wonderful to know that these products are natural and pure. I love the smell of coconut, and they are finding more and more ways to use it. In this Perfectly Pure set it just sets another great example. Please let the entry form below load , enter and good luck! This blog Tales From A Southern Mom did not receive any free product for this posting . Promotion Starts May 01. 2014 12:00am/est and Ends May 06,2014 at 12:00 am/est. This giveaway is open to US residents only age 18+ The winner will be selected at random via Random.org. and contacted via email. Only one entrant per mailing address, per giveaway.The winner will have 48 hours to claim prize. If prize is not claimed, prize will be forfeited. Facebook, Twitter, G+, Pinterest, or Instagram is in no way associated with the giveaway and released from any and all liability. Sponsor is responsible for mailing prize to winner, not Tales From A Southern Mom or Nanas Deals and More. 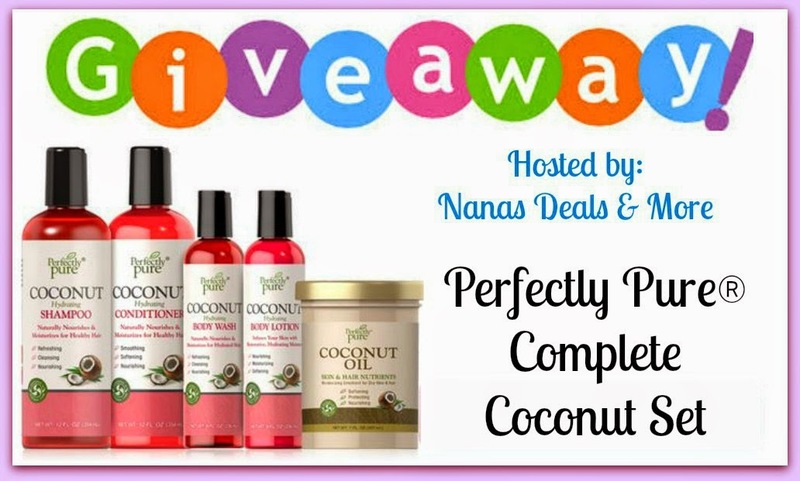 I have heard so many good things about coconut oil and would love to try it for myself.